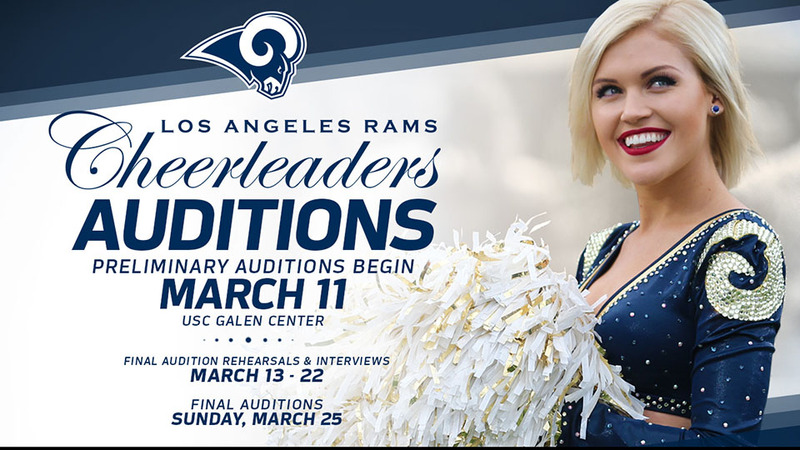 The Los Angeles Rams are hosting cheerleader auditions for the 2018 season starting Sunday, March 11. Los Angeles Rams Cheerleaders not only perform at home games at the LA Memorial Coliseum and at Estadio Azteca in Mexico City, but also participate in public appearances, events and community service across the Los Angeles region, nationally and internationally throughout the year. Candidates looking to audition must be 18 or older by Thursday, March 1, and must register online by Thursday, March 8. Walk-up registration is not available. Coverage from last year’s preliminary auditions can be viewed at therams.com/cheer/videos. In addition, the Los Angeles Rams Cheerleaders are hosting four voluntary workshops prior to auditions at 24 Hour Fitness locations throughout the LA region. Each workshop includes one hour of dance led by Choreographer JOHN PETERS, followed by a presentation and a Q & A segment with the Rams Cheerleading Director KEELY FIMBRES. Workshops cost $40.00 per person and have limited availability. Footage from last year’s workshops can be viewed here. Interested candidates may sign up for workshops at therams.com/cheerleaders/workshops.